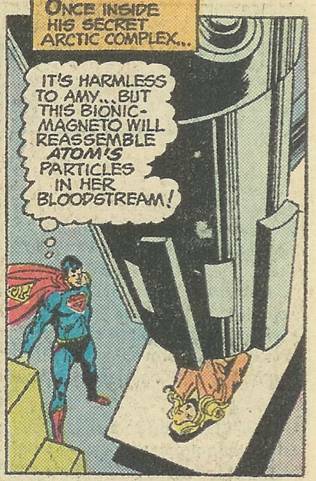 Superman's True Weakness - And Atom Dies! Kryptonite right? That stuff is murder to the Man of Steel. 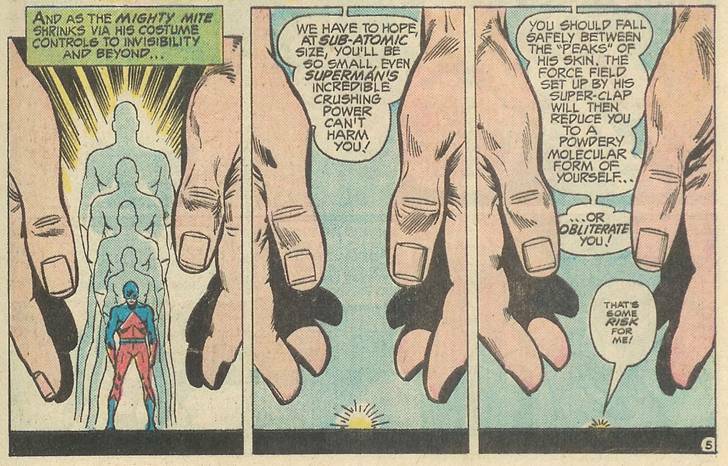 We all know Earthly radiation can harm human beings, so why can’t Kryptonian radiation harm Superman? That’s something we all can relate to, but it is not Superman’s true weakness. How about magic? Yes, Superman is susceptible to magic. I’ve just found it hard to accept that the Blackthorne or Mandrake or Doug Henning could kill off Superman. No, not magic. Yes, the Man of Steel CAN’T BE PULVERIZED! That’s his one weakness, straight from his mouth! Poor guy, but hey, we all have to work with what’s given to us. I’m not sure how you could use this as an advantage, even Luthor, super genius he is, would have some difficulty with that one. And there you have it. 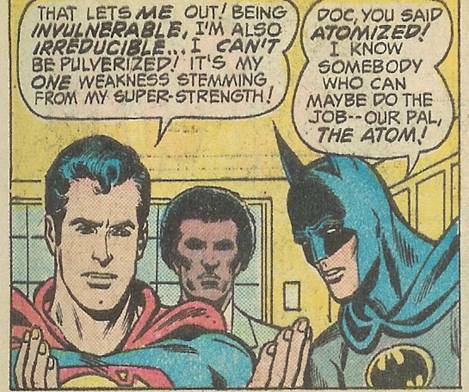 Poor Atom… well, at least he felt no pain. Peace be with you Mighty Mite, and a pox on the foul Superman who so cruelly took you from this world! Huh? You know, I read, re-read and re-re-read all the above panels in a vain attempt to understand what exactly happened, and I still don’t know. 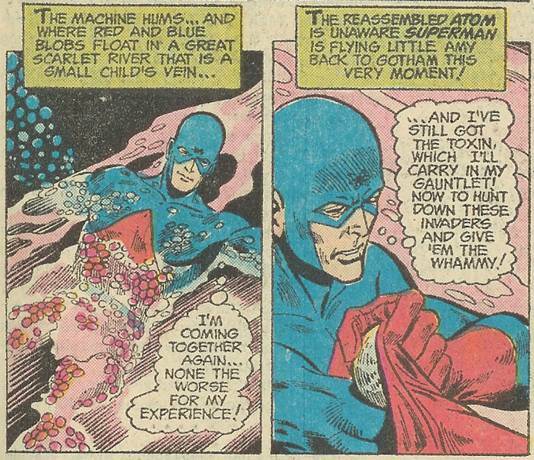 I don’t know why the Atom even had to be pulverized, why Supes thinks NOT being pulverized is a weakness, why skin peaks are protective, why claps generate electric force fields or anything for that matter. And why would a regular MD even suggest this as a treatment (you are infected, so we’ll shrink down and pulverize the Atom, then while he’s good and mashed, inject him into your bloodstream, where Superman will recombine him, allowing the Atom to directly deliver the toxin to the alien germs). 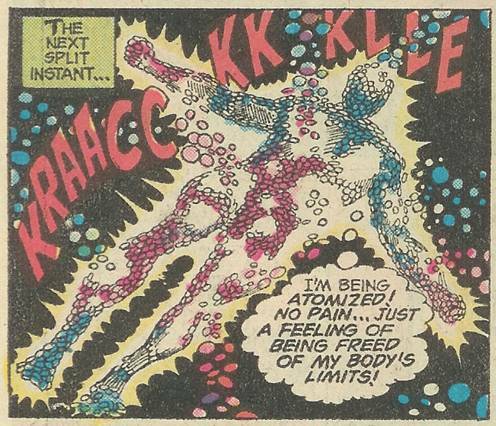 Granted, couldn’t they have just injected a shrunken Atom directly into the patient’s bloodstream without the mashing? And the absolute kicker? In the exact same story, Superman later shrinks down using his Kandor shrink ray and meets up with the Atom inside the patient. So, WHY DIDN’T THEY JUST DO THAT IN THE FIRST PLACE? This is really giving me a headache. Think I’ll take two Atoms and call you guys next month.